It's me Frenchie I'm back for my regular post at Tina. Yes every other Thursday I will visit or should I say I will be the guest blogger. 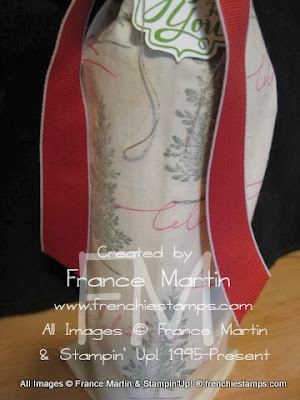 So today I will share a quick way to decorate a "Fabric" wine bag. Yesterday on my blog I posted the Stampin'101 on how to stamp on fabric and I save this one for today blog. Stamping on fabric is just like stamping on paper. If you are interested in the video YOU can CLICK HERE to see. This is using the Lovely As a Tree stamp set on page 78 wood#128655 clear#127793. I think this stamp set is the oldest in the catalog and still one of my favorite. I stamp the tree in Always Artichoke. Using the Cherry Cobbler ribbon #132135 and the tag is the single stamp A gift for you #134765 with the punch Label Bracket #132153. That is it to this quick bag. If you are wondering where I got the wine bag well I made them with some muslin, I'm not got on the sawing thing but this is easy plain stitch and one on each side. :) So if I can I'm sure you can. Now don't forget to hope on my blog to see the lovely project that Tina is sharing CLICK HERE to see and please leave us a comment to let us know what you think of the Passport Pals we'd love to hear from YOU. Great job, I have stamped on fabric before but used a fabric ink, it's fun to co-ordinate the tag with the wrapper.